BMW CEO Harald Krueger will be the keynote evening speaker at the Automotive News Europe Congress on June 8 in Munich. Krueger is steering BMW into its second century by diversifying the BMW brand's product portfolio and increasing the automaker's stake in electrification and connectivity. 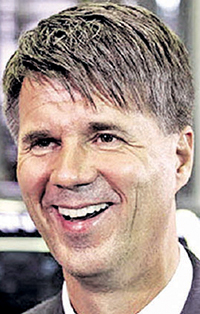 Krueger was appointed chairman of the board of management and CEO of BMW AG on May 13, 2015. He joined the company in 1992 and, over more than two decades, worked his way through the organization. After stints in Germany, the U.S. and the U.K., Krueger in 2008 joined BMW's management board where he was first responsible for personnel and later for the Mini brand as well as production. As production boss beginning in 2013, Krueger oversaw the expansion of the global plant network, including adding capacity in Spartanburg, S.C., and laying plans for a factory in Mexico. The Rising Stars ceremony and Automotive News Europe Congress will be held June 7-8 at the Hotel Sofitel Bayerpost and BMW Welt in Munich.